Reflections for Police Officer Rogelio Santander, Jr.
Roger, Monday when you came in for 3rd watch and I was checking in my gear, you asked me a question. We got to talking and laughing before you and Crystal cleared for patrol and I went home for the day. Had I known that was our last laugh, I would had stretched that laugh out for a long time and shook hands with a tighter grip. See you on the horizon my friend. 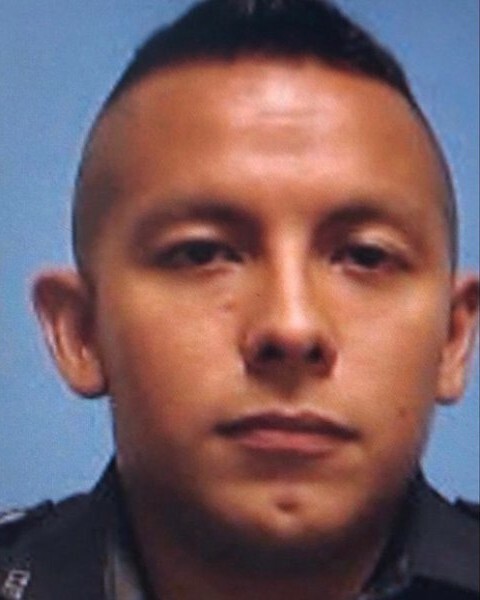 Rest with God officer Santander, your dedicated service, and ultimate sacrifice will not be forgotten. Prayers for your family during this time in their lives. Prayers for the other officers also hurt and for the DPD. Rest easy Brother. May God's love shine down on your family now until you see them again. Rogelio Santander was a quiet young man with a wonderful smile. I had the pleasure of working with him on the night shift. I will never forget my little brother in Blue. God Bless You, Your watch is over. Rest In Peace Brother in Blue. Rest In Peace my Little Brother, we’ve Got Your Watch From Here. Our most deepest sympathies to the Dallas Police Department and to the family of Officer Rogelio Santander. Our hearts go out to you. R.I.P Officer Santander, God Bless! Rest easy Brother, Thank you for your service. You won’t be forgotten. Rest in Peace brother officer. Thank you for your service. We are very sorry for the senseless loss of Officer Santander . R.I.P. Brother and prayers to the Family Departmentand the Community he served. Thank you for serving the people of Dallas. We’re proud of you and all you did to protect our citizens. Our prayers are with you, your family, and your fellow officers. God bless you all. And spend alone many long nights. Just as if he'd gone off to war. It happened in your town or mine. And a part of America died." Our thoughts and prayers are with you and your families. Brother Santander, rest in heavenly peace, We have the watch. USN-RET. "Fair Winds And Calm Sea's My Brother". God this hurts my heart. This job we do isn't for the weak minded. I don't have words to console your family because I think of my own family and where they would be if my next watch was my end of watch. Stay vigilant and don't sweat the small stuff. Everyday we wake up to our families is a miracle . From the Largo Police department (FL) you are missed and never forgotten. My heart and prayers are with you and your family, my Brother. Thank you for your service & most of all your sacrifice. Your flame will forever burn. God bless you Mi Hermano. Prince George’s County Police. Maryland.